Robert Bresson famously referred to his non-professional actors as models, and he even more famously bypassed people altogether when he chose an animal to be the centerpiece of Au hasard Balthazar. Why not, then, extrapolate even further and cast an inanimate object as the lead? Bresson's final film, L'Argent, settles on a nominal protagonist after a fluid opening sequence, but its true centerpiece is its titular object, an item of artificially created meaning and worth but one that is, in the words of one character, "God incarnate." Bresson's films, despite their stark framing and minute focus on detail, always seem to capture the world, and generally not in flattering terms. But there is nevertheless some kind of release to his work, even if it occasionally borders on Flannery O'Connor levels of grotesquely ironic. Such a release is absent in L'Argent, which ends on one of the most profoundly unsettling notes I've ever seen. Some directors grow soft with age; Bresson, 81 when the film premiered, unleashed his most unsparing evaluation of the human race in a career rife with piercing, harsh insights. The opening sets the tone of the film, with diegetic sound comprising the totality of the audio track and a combination of close-ups and taut editing propelling the action. The frame opens on a static close-up of an ATM machine before jutting abruptly to the bourgeois home of a young boy named Norbert, who enters his father's office to ask for his monthly allowance, plus an advance to pay off a debt he owes another schoolboy. The father gives his son the allowance but refuses the advance, leading Norbert to a friend who wants to test out a counterfeit 500-franc note. The boys head to a photo shop and buy a frame, paying with the fake bill and even getting change back. When the shop owner returns, he spots the fake but decides to pass it and some others off onto someone else so he doesn't have to eat the loss. He therefore pays the gas man, Yvon (Christian Patey), with the fake bills, which results in the man being arrested when he attempts to use them in a restaurant. Throughout this sequence, Bresson tightly frames hands as the money is passed to each new person. 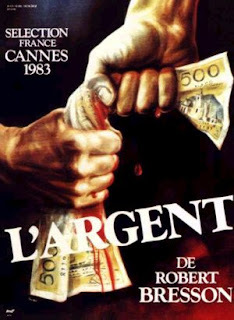 The figures on the bills are the nearest the film comes to a close-up of a face; Bresson's synecdochical representation of humans in a commercial world are the hands that allow us to fork over cash for goods. Though Bresson's framing drains the film immediately of any verve, the rhythm of the editing generates tension over the risky game of hot potato the characters play, each one in danger of being caught using counterfeit money until the oblivious one falls prey to the accumulated greed and self-centered behavior of the rest. But for this initially innocent man, the inadvertent crime is but the start of a spiral into money's power. Which is not to say that money didn't already rule his life, however; Yvon merely had an understanding with money. As an oil company employee, he's on the front line of sending money into the most profitable industry in the world, and for that he receives enough to support his wife and young child. But Patey is just as dead-eyed and posed as the rest of the non-professionals littering the film, maybe even more so. When he must defend himself over the counterfeit charges, Yvon protests his innocence in flat deadpan, and he does not even flare with rage when the clerk of the photo store, coached to deny Yvon ever coming to the shop, slightly shakes his head at the police. This action cements Yvon as the ostensible lead of the film, as the rest of L'Argent follows the aftermath of this swindling and how it drastically alters the course of the man's life. Greed the film shows in abundance, but Yvon embodies another deadly sin, pride. Resentful of being taken for guilty, Yvon ignores the needs of his wife and child and refuses to apologize to his boss, prompting his dismissal from the oil company. Instead, he falls in with a criminal gang who hire him as the getaway driver for a bank heist. In 1959, Michel got by as a pickpocket; in 1983, Yvon has to rob banks. Inflation, it seems, affects even the movies. Yet for such a personal upheaval, Yvon's turn to high crime is so calmly presented that this development seems but a natural progression for the man. Bresson even manages to fluidly tie Yvon's progress to that of the clerk who denied knowing him after taking money from the photo shop owner. The young man, Lucien (Vincent Risterucci), resents the owners for making him lie; having committed one crime in perjury, he finds it easier to commit others, chiefly skimming from the top by charging shop customers than the products are supposed to be marked and pocketing the difference. When the owner confronts him, Lucien calmly says, "I thought dishonest people had an understanding. As with Yvon, Lucien's wounded pride gets him fired, but unlike Yvon, Lucien takes care to bring copies of the store and safe keys with him. Lucien is no more animated than Yvon, but he makes for a more abrasive doppelgänger. Both men naturally progress to crime because of the capitalist system that sways them, but Lucien, who receives benefits from that system to maintain order, rebels more consciously. And when the former clerk arrives in prison, Bresson uses the same shot setup of him getting off the bus that was used to show Yvon entering prison. With his steady editing, Bresson establishes what is an odd series of events as logical, though the punctuative effect of the cutting gives each new twist an even more severe impact. In the absence of music, the editing takes on the effect of its own fright cues, its jumps occasionally startling for their jarring of still frames and still action. To maintain a lack of blunt action, Bresson elides over what would be the centerpieces of other films: locked in solitary confinement, Yvon receives Valium each day to calm him. But when the guards leave, the camera stays behind to show Yvon spitting out his dose and adding the pills to a collection he's hidden. The next shot is from his old cell where his bunkmates watch out bars to see an unconscious Yvon loaded into an ambulance. This elliptical approach to editing, which leaves out the action but leaves no doubt as to what happened, somehow proves more disturbing than watching Yvon scoff a fistful of pills would have been. This is even more true of his actions post-release, which Bresson stages with horrifying subtlety. Before leaving prison, Yvon spots a knife in the kitchen. Upon his release, he follows directions to a hotel, where the couple who owns the place silently greet him. The door closes, and the frame cuts to Yvon coming downstairs to wash blood off his hands and take off a blood-splattered coat. He subsequently follows an old woman home after watching her make a withdrawal at the bank, and Bresson cruelly teases a hint of redemption in the woman's kindness toward him. But when Bresson later cuts to the family dog barking at night and follows the animal's whimpering trajectory around the house after a lamp-and-axe-toting Yvon, that momentary hope for grace extinguishes. The moral of the story is simple: Bresson bypasses political commentary on capitalism to go straight to "money is the root of all evil." But the framing of these Raskolnikovian scenes belies any trite summary. Though Bresson's camera is so tranquil and distanced, he intimately conveys the sense of money's pervasive influence in society and, by extension, the human psyche. There's some form of tradeoff everywhere, including prison, where goods are exchanged secretly but with no real obstacles. Perhaps that's why counterfeiting is treated so seriously among the characters: counterfeiting exposes the empty, symbolic meaning of money, threatening to unmake every aspect of civilization by eroding its foundation. In prison, Bresson frames the visiting room in such a way that it's hard to say which side of the dividing glass holds the true prisoners. When Yvon enters the old woman's bedroom in his climactic crawl through the house, he asks her, "Where's the money?" The question speaks not only to his literal greed but his violent disconnect with what he thinks money is and what he (like everyone else) knows deep down what it truly is. He never receives an answer, and L'Argent ends on one of the most nihilistic notes of any film ever made. Money continues to rule all, and no one can see through its aura. But what makes the ending truly insidious, truly hopeless, is the inevitability of it. Pickpocket and Au hasard Balthazar are no less carefully controlled, but their downbeat endings are regretful, giving off the sense that it might all have been different if even one thing didn't happen as it did. There's no sense of regret or sadness in L'Argent because there's no sense that anything could possibly have turned out another way. That makes the conclusion all the more terrifying: this is the endpoint of capitalism, and Bresson won't lie to the audience by suggesting there's an alternative way of life that might win out.